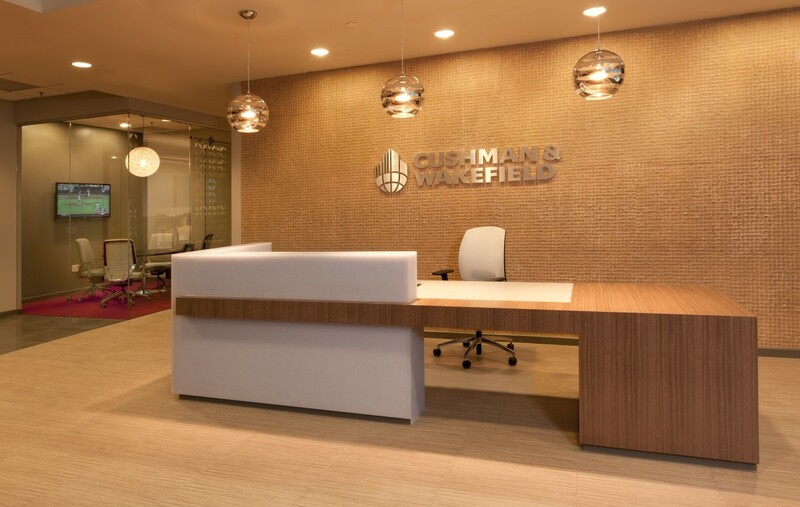 Cushman & Wakefield breaks industry paradigms with new offices that highlight interconnection. 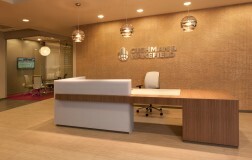 As global leaders in the field of commercial real estate, Cushman & Wakefield has witnessed firsthand evolving strategies for the modern interconnected workplace. 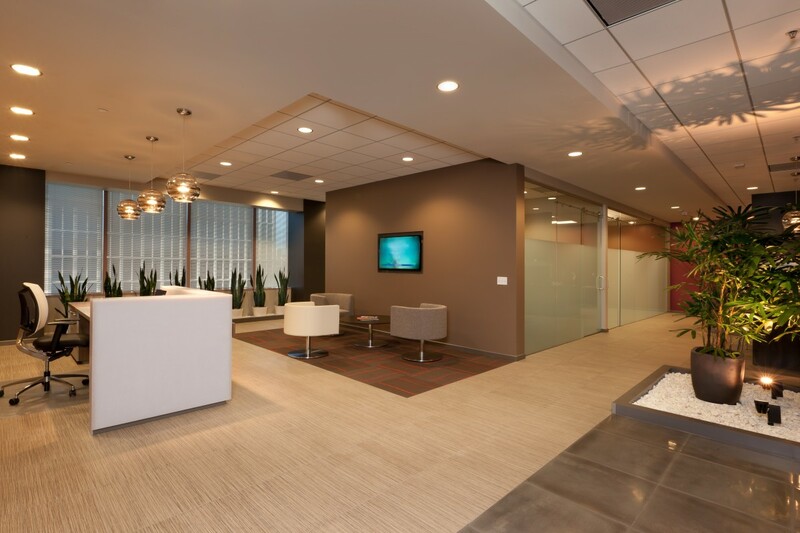 When the time came for C&W to evaluate its own office needs, the firm’s Sacramento-based leadership decided a change was in order to bring their space use more in line with their own brand. 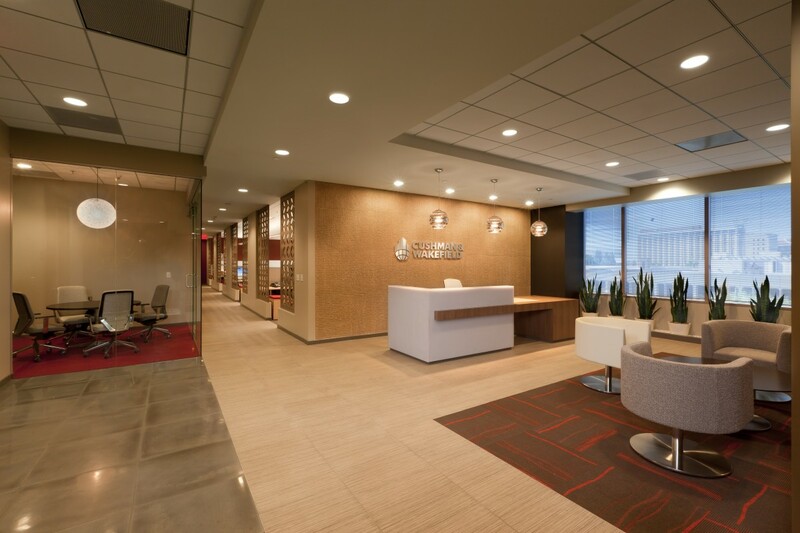 C&W’s direction to the RMW design team for their new offices at 400 Capitol Mall was to leave behind the paradigm of every broker in a private office, in order to create a collaborative work environment that celebrates the team structure. Working closely with C&W leadership, RMW delivered a workspace designed for social interaction, the medium of C&W’s business strategy. There are no private offices. All of CW’s brokers now collaborate in a single large open day-lit office and are plugged into a furniture benching system with low panels. Everyone works in an open area in modern and efficient benching desks. 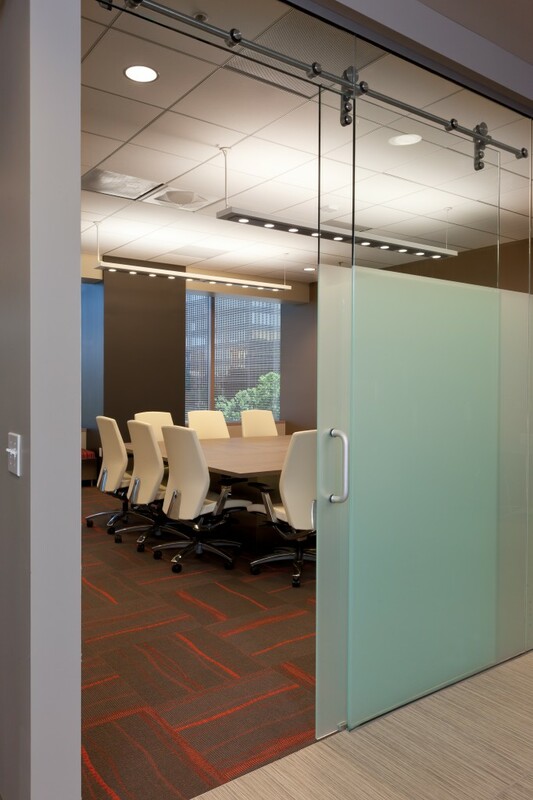 Functional areas are defined by layers of transparent glass, screen walls or changes in color and texture. 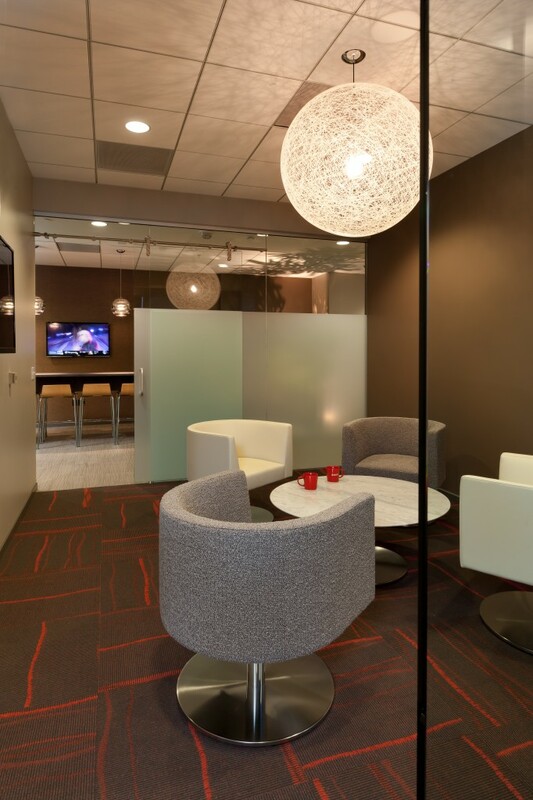 Movement through the office is unimpeded and activities can move between spaces with ease. 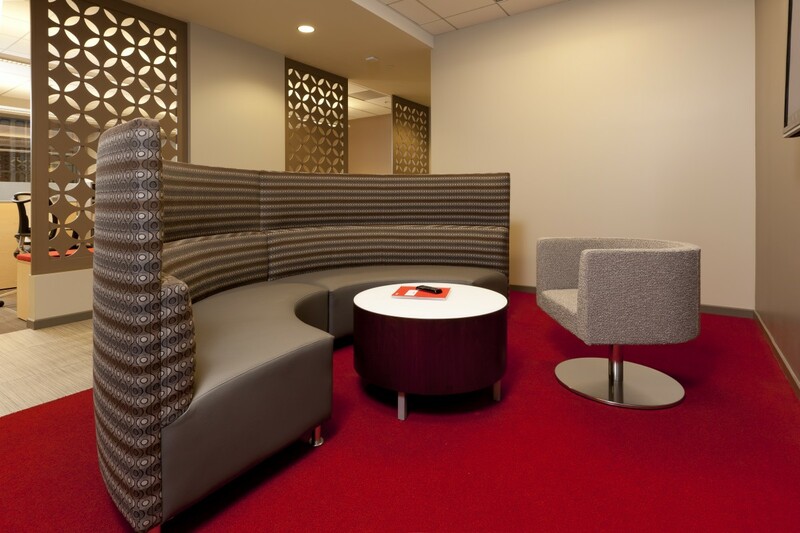 Tasks get done in a variety of casual and formal settings — an open café, an informal lounge, huddle space with lots of technology and, when necessary, acoustically enclosed conference rooms with glass walls. 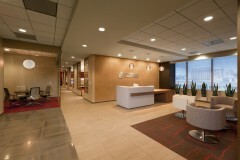 The project has redefined how C&W’s brokers work. It’s a step away from a traditional private office environment that acknowledges the collaborative nature of the brokerage business. 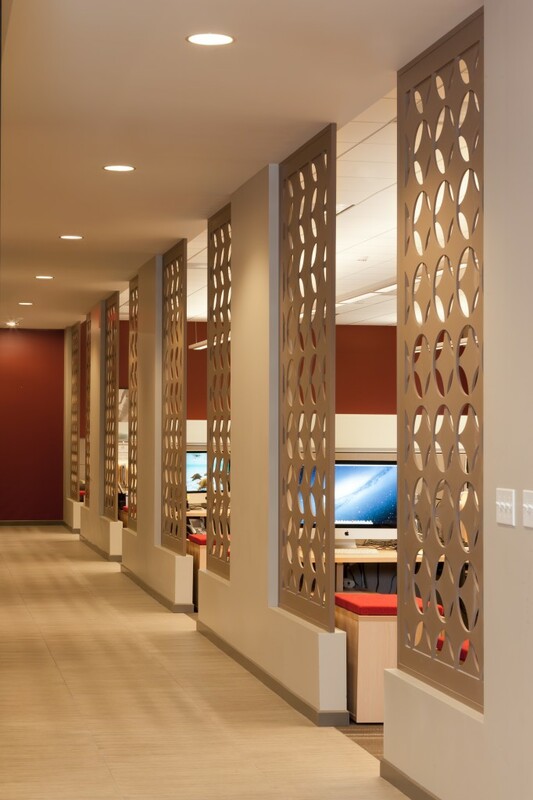 It is an opportunity for C&W to experience firsthand how office design responds to real estate pressures to drive down costs by reducing the square footage per employee and building fewer walls. 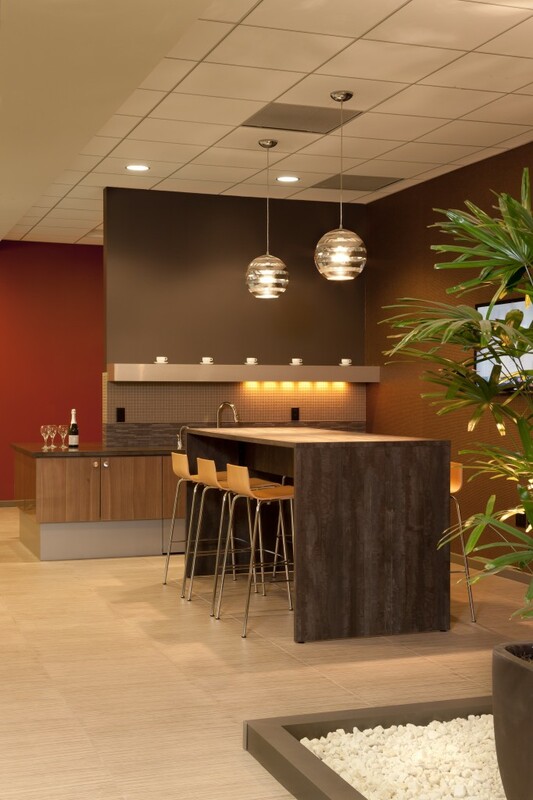 At the same time, C&W can use their space as a model to show these trends to their clients. Their new workplace is a vibrant, efficient environment where C&W’s broker teams can focus on success in a fast-paced global business market. Functional areas are defined by transparent materials or changes in color and texture, rather than boundaries. 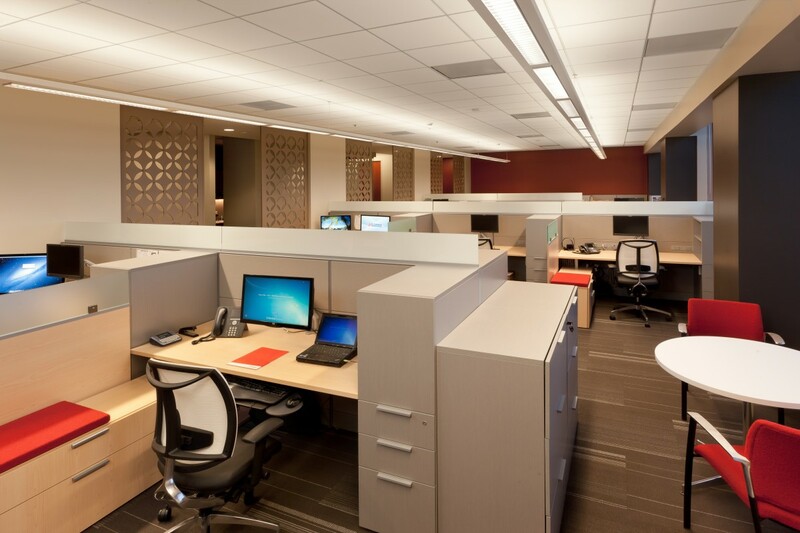 Efficiency in work area allowed 60% of the space to be allocated for meeting areas, support space, and amenities (versus 20-40% in a typical private office plan).